Workwear From the Archives | Dickies 1922 Collection | A Continuous Lean. Go, go to your archives. That was the call, and Fort Worth-based-workwear-juggernaut Dickies heard it and is re-releasing its “Uniform Shirt” ($175) and “Uniform Pant” ($200) this coming July. Both pieces – part of the company’s new 1922 Collection, which will initially be available at Unionmade in S.F., Stronghold in L.A. and Luther’s in Austin – are made in the United States at the oldest and longest continuously operating Dickies factory in Uvalde, Texas. Boom. Made from twill Type I Cramerton Army Cloth, both the Uniform Shirt and the pants come in two color variants – Khaki and Suntan. The 1922 shirt comes two ways, with short or long sleeves and the pants are offered either hemmed or cuffed. This is a small start, but hopefully this will be a beginning to a larger movement of American production from Dickies. 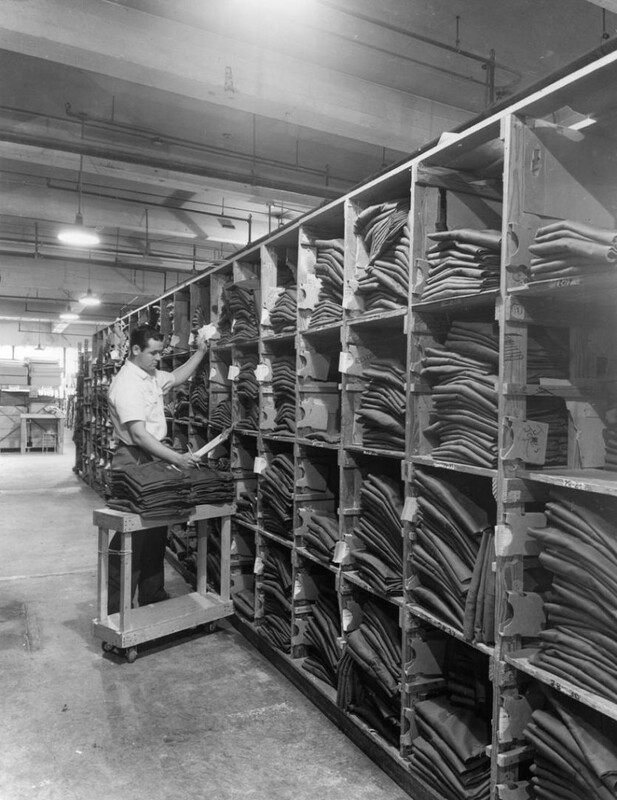 Sewers making Dickies from the company archives. The new 1922 pants feature the "brush mark" logo. maybe the clothing business will revive small-town America. One can only hope. A Dickies work shirt for $175. Seriously? I think it’s cool they’re reviving old designs and making them in the U.S. But I agree, at $175, that’s catering to a reaaaallllly niche market. I hope they lower the price, not only so I can buy one, but also because I fear the pricing might make it initially unsuccessful, and sometimes company decisions can be fickle–they might pull the plug on the idea too soon! Nice shirt and pants, though. I actually saw a sample of these – they’re beautifully crafted. There’s selvage that runs down the inside trim of the shirt. It’s definitely worth the money. Especially given you’re paying similar prices for non-US made RRL’s and what not. I’d say take a look at the shirt before passing judgement. These are really really well made. They’re American made too (with US sourced fabrics and trim), so if you’re in the US, might be worth giving your support. I’m sorry, the price is not justifiable. They already have the patterns and factory. Great, but $375 for a work uniform is pretty stupid. Might be made in the US, but is it a union shop with American workers? $375 is hilarious. This has obviously been aimed at people hungry for borrowed nostalgia with no sense of value. I was a Dickies customer for years and felt ripped off when their work jackets went to $60. This sort of goes to the heart of the workwear backlash: Why doesn’t Dickies price this obvously ltd. edition design within reach of blue-collar guys who would rather “buy American” but can’t? I’ll bet that at $75 it would fly off the shelves…thus increasing production…thus creating or sustaining U.S jobs…etc. etc…. Yeah…nearly $400 to look like a zoo keeper…. The only way this could work is if the laborers could themselves afford to buy the clothes they are making. I’m willing to bet that isn’t the case in this instance. I understand and appreciate their efforts, I’m a huge fan of vintage and vintage-inspired clothing (especially those efforts that go the extra mile to produce goods back here in the U.S.) but most of the time even I feel like the prices are unreasonable. First off, hats off to Dickie’s for at least making an effort to change the perception of their brand and their products. Let’s not forget that Apple was nearly dead and buried in the mid-90s before Steve Jobs was brought back to right the ship. With the right vision and execution, any company, new or old, can be successful. ACL isn’t just a blog anymore, it’s a movement. 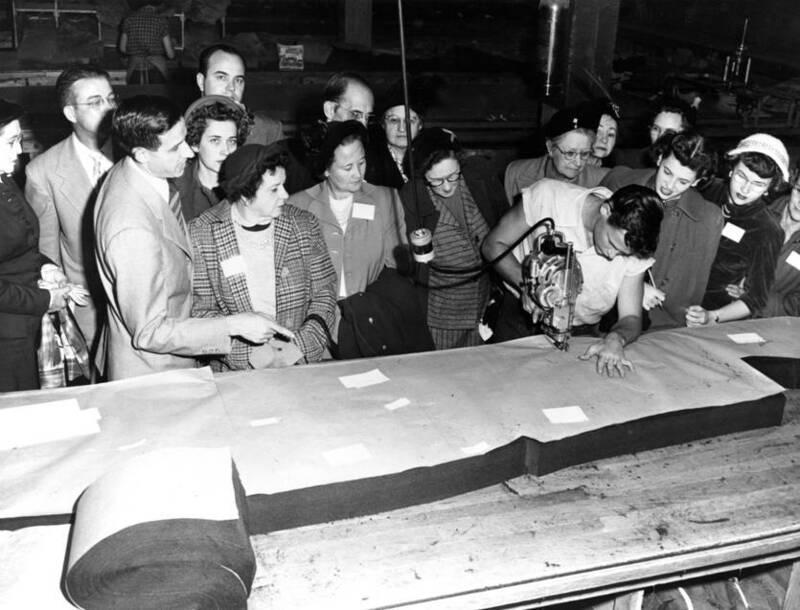 The specific topic is fashion, but it speaks to a larger purpose and that is the return to high-quality, built to last, American-made goods that helped shaped this country. So, for all of you above that are judging the product before it has even been shipped, just give it a chance. Let the product speak for itself before you declare the effort a failure. I agree, we shouldn’t be so quick to pass judgment, and my previous post was probably too pessimistic. But I know for myself, I will not be able to afford the shirt or pants, and probably wouldn’t by them if I could. The reason is more of a form follows function argument for me. They are supposedly “work shirts” and “work pants” for a uniform. I wouldn’t pay hundreds for a uniform I knew was going to get dirty and ripped. I just have a feeling that part of the price has to be the “nostalgia” factor and isn’t just the necessary additional cost to pay for stateside labor. But I could be completely wrong; for all I know they may not really be intended as work clothes at all. Perhaps they really are just the nostalgia factor and nothing more, in which case I am sure there are people who can afford them and will buy them, even if they never really work in them. I’ll just have to wait and see like everyone else! I do hope they come out with some cheaper, work-oriented alternatives also made stateside, however. Have to agree with Peter on this one. It’s a sad state of affairs when the only way to buy good looking, well built America is to seek out obscure menswear boutiques or proxy through Japan. Which company is going to step up and start a made in America line that is affordable? While people talk about the trickledown effect with these small runs, ultimately all that trickles down is the style (I’m sure we’ll see Selvedge Oxford Workshirts at Old Navy in a year or two, made in China) but not the means of production. 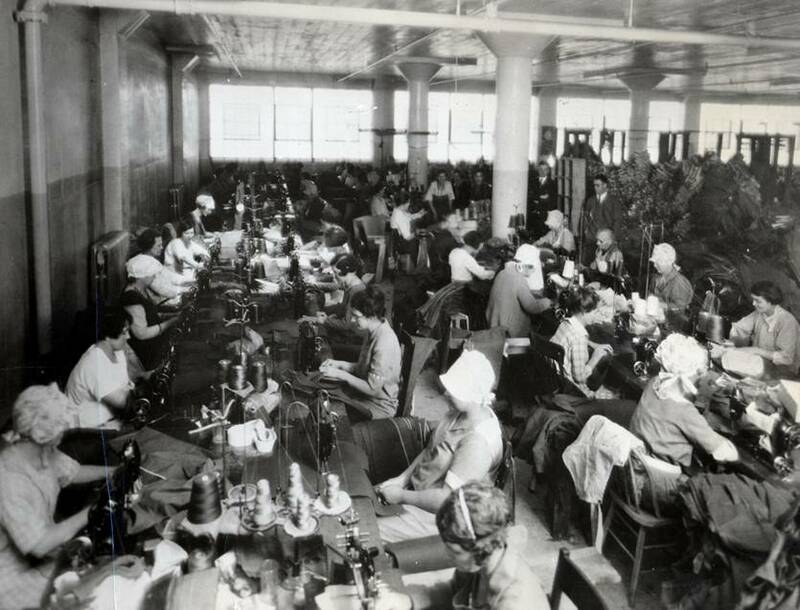 The reason you will probably never see American, Union made clothes of lore made affordable is because of the Unions themselves. Union made and affordable is an oxymoron. Ryan, you don’t need to wait a year to see Selvedge Oxford Work shirts made in China – they’re sitting at J Crew. Borrowed Nostalgia would be a good band name. Okay, now I’m going to have to hunt down a few yards of Cramerton Army cloth with which to experiment. I’ll just add it to the ever-lengthening list. Maybe for the retro-trust fund baby-hipsters, but not for the actual working class who once wore these. There are still affordable, US-made apparel and accessory items out there. Unfortunately, most of them are fugly and/or not well-designed in terms of fit or materials used. I’ve come across US-made jeans for under $40, but were stone-washed and had a fit that would make even Obama think twice. As for these Dickies, I think I would rather pay $100 less for Bill’s Khakis or Save Khaki United pants. They may not be Cramerton cloth, but they’re still US-made. 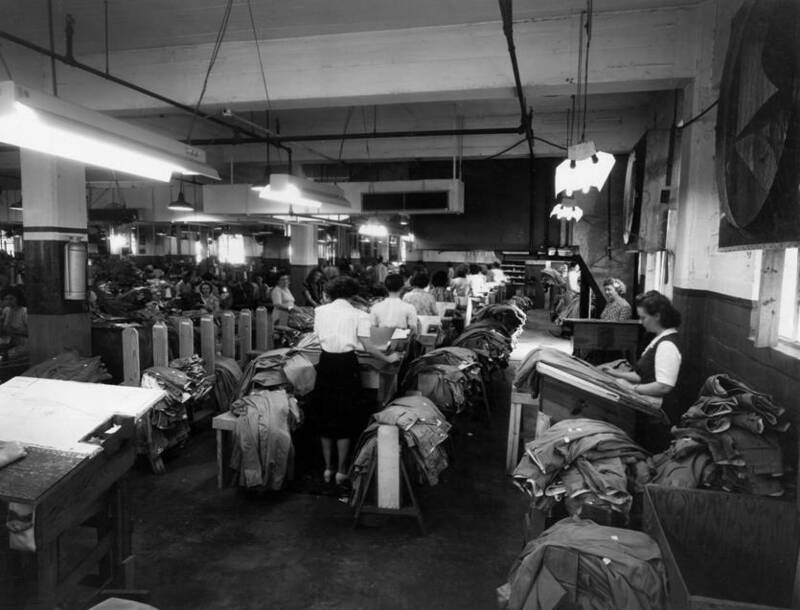 The double-edged sword of these awesome archival items with all their legend is the fight at the bottom for the egregious working conditions in the cotton mills that provided the material, etc to small-town clothing companies. “Lint-head” was the term for cotton pickers and millers in the South and arbitrary firings and sometime violence came to anyone who asked for or demanded better conditions, and unionizing could bring really horrible violence and sometimes death. Aesthetically pleasing and functional, some of our greatest examples of material culture were “washed in blood”. Unfortunately, American manufacturing has been moving towards mediocrity for decades. Levis and Dickies, etc. have been able to sell millions of items by lowering their standards. Now they’re not tooled for the high quality stuff, so to make special editions to higher standards costs them more (and also gives them cache among collectors). For example, Dickies ill fitting, square cut, cotton/poly blend work shirt can’t touch this special edition and is probably manufactured for 1/3, 1/4 the price. I find it hard to criticize nostalgia for quality. If more people were willing to support quality American manufacturing the prices would come down. Carpenters don’t buy cheap tools. A good carpenter will spend money on a real harness-style tool belt made of bridle leather because he knows it’ll last. Smoke jumpers and loggers wear Whites boots for the same reason. Keeping that in mind, Dickies price point isn’t far off. Carpenters may not buy cheap tools, but they wear Dickies from Wal Mart. They’re made to work in, hence the poly cotton and “square cut”. A dozen years ago they were still union made and cost about $20. I’m sure Wal Mart had somethin’ to do with moving production overseas. No one is goin’ to spend half a pay check on a pair of pants and a shirt. I may have only hit a quarter of a century in age, but I’ve been a dickies supporter for well over a decade, and to see a good-looking pair of button-fly’d throwback-style slacks is a breath of fresh air. Though, I walk along side with most of you in my initial judgement of the price. It’s lofty, and very boutique market. But, I’m really wishing for a few people to throw money at this line in hopes that a bigger production run could bring down the cost. It does sound, however, that the devil may be in the details and if these products fit as good as they look and hold up well, we may be seeing a reasonably priced future for Dickies past. Square cut meaning the tails, not the hep factor. Square cut meaning the tails, not the hep factor. Manufacturing Dickies out of cotton/poly with square tails and no tailoring details makes them cheaper but also of lower quality. That’s all I meant. reading all of these comments is a tad annoying. what everyone has to remember is this is not the typical 30 dollar poly blend dickies pants. its a pair of well made, 100% cotton khakis that are not meant to be worn in the fields or to bang nails. IF thats what youre doing 9and i have a high suspicion that most peopled that read this blog arent those people) then go BUY a pair of the 30 dollar dickies and ruin them. these are made to OWN and be worn – and to wear for a long fu$&ing time. the style has been around for 80 years and wont go out of style unless we suddenly decide that luke skywalker was onto something and decide to wrap ourselves in cloth – so why not invest in a pair of pants that will look better with each wash (unlike the pre washed khakis of Bills, etc – that will fall apart after a dozen washes). I bet a majority of people above would have NO problem blowing 200-300 on a pair of jeans by some “im keeping it real” denim designer from the lower east side of nyc. but for fun – instead of bitching about it – do the math and realize that if you bought a pair – wore them once a week for two years (yes they would easily last that long) you would be spending 2 dollars per wear. i have plenty of pants ive had for more than 2 years. some for over 10 years. lastly, i think dressing like a zoo keeper is cool. when is the last time you saw someone wear that as an outfit? i would give someone serious props for pairing those tow items together at once. try being different for once. wear a uniform. think about that and see where your head lands. Weird…no one gave a rat’s a** about rotten working conditions back in the heyday of American clothing manufacturing. Maybe it’s all style over substance with y’all. 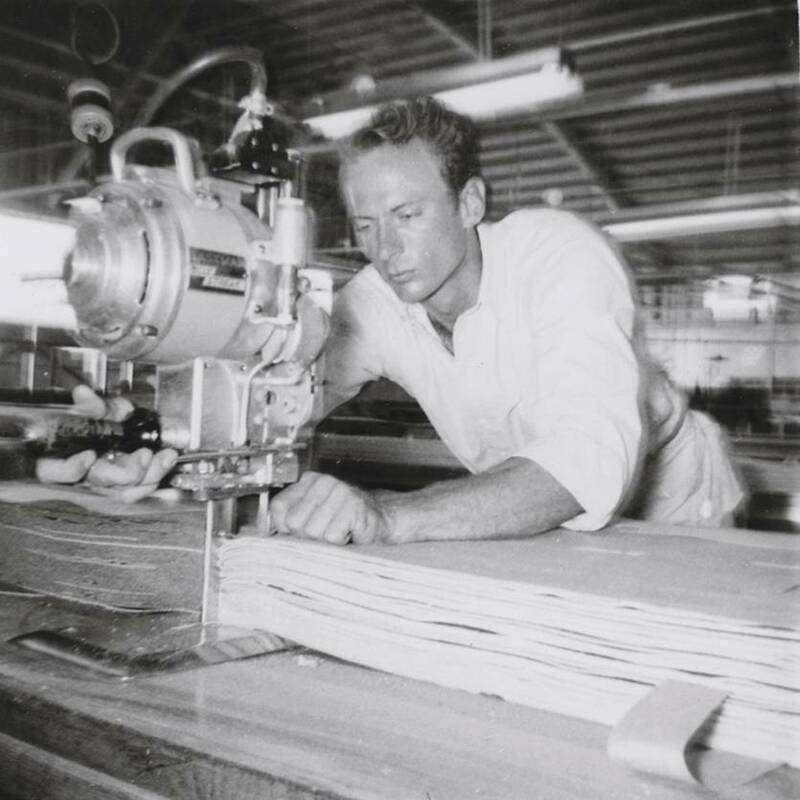 It’s great to see an original American manufacturer reaching back to their past making an accurate reproduction of classic American workwear. Up until now the only way to buy an authentic reproduction of the classic khaki trousers was from Buzz Rickson in Japan. Forget the lame attempts by Levi’s K-1, Bill’s Khaki’s, J Crew and RRL (made in China). Even if I have to pay more I’d much rather give my money to an American company making faithful reproductions of classic workwear right here in the US. I had the chance to actually see and feel the product. It is the best twill garment I ever approached. Everything was done in a meticulous way. Bravo Dickies. you can pick you pants, you can pick your nose, but you can’t pick your bird with two stones…it’s like killing your nose to cut your pants…it’s just spiteful. I agree with Jay’s post earlier regarding the difficulty a brand has in moving up the food chain, once it has eaten the fruit of the discount chain distribution channel. Many have tried, many have failed. I, for one, think that what Dickie’s is trying to do, while laudable for it’s American roots and manufacturing intent, will meet with a great deal of price resistance from the consumer. The story says these items are being manufactured in a currently-running Dickies factory in TX. What s being produced there now? I had assumed that the company had halted all domestic production as was going to pull a Levi’s by having a contractor in the US produce these items. This is definitely for the afficienado and stylin collector…no different than owning an Armani Suit…there is a customer for this as noted by the exclusive vintage clothing shops across the US. Kudo’s to Dickies. I havent read through all your comments, but did notice some questions about the pricing, they might seem a bit over the top but lets face it more than half of our population buys jeans that cost over an arm and a leg just because they are some name brand, why not Dickies? 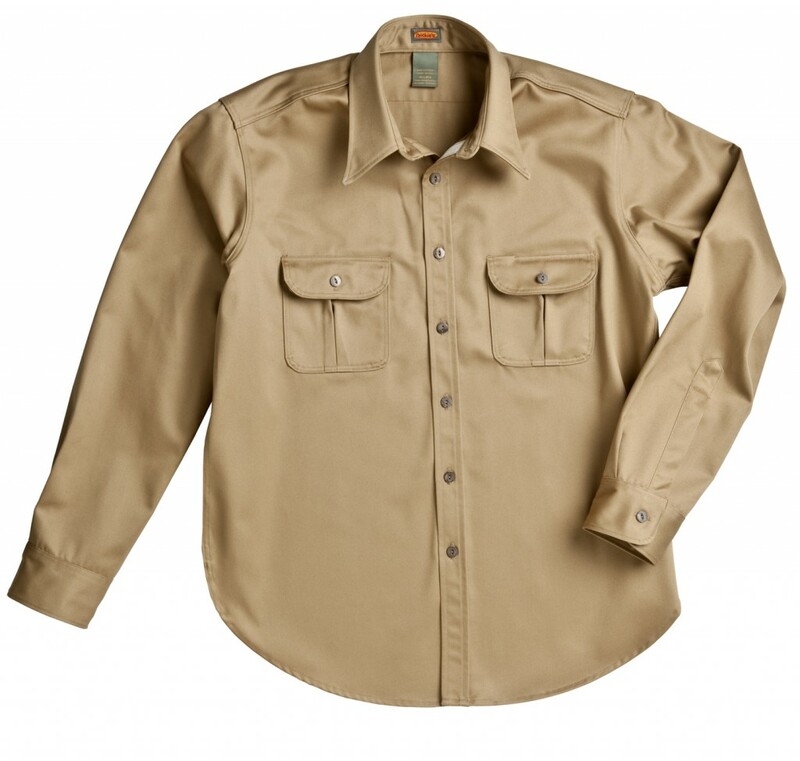 Dickies is one of the best our there and their products are set to last a lifetime. Now the pricing in Dickies, I can guarantee you, has a lot to do with the dedication, craft, durability, quality, and the materials used to make the garments. Do some research and you all will be surprised! the pants, fabric, craftsmanship…are truly amazing! and the shirt is very cool too. I saw it recently and want a set very badly. I would pair the khaki shirt with a pair of classic levis… and then wear the hell out of the pants with every imaginable top there is. flannel, tshirt, chore coat… it goes with everything. heard smith and butler in brooklyn is carrying the stuff. thanks dickies. it will last a long time and is worth the price. BUY local!